Chantal’s Raw Apple Cider Vinegar is made from the ‘must’ of pressed New Zealand organic apples. Unpasteurised, Unfiltered and naturally fermented we preserve the ‘Mother of Vinegar’ in every bottle offering a full bodied nutritional vinegar. Use in dressings, marinades, or take a teaspoon a day for general health. 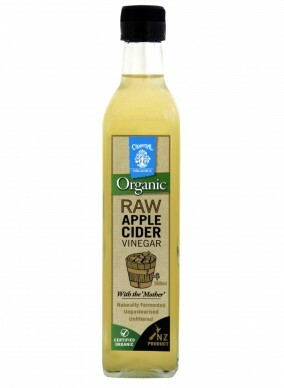 Our Raw Apple Cider Vinegar is an essential pantry companion for every household and being certified organic guarantees our commitment to the environment and your wellbeing.